The older I get, the more college students come through the doors of the CDC. Be they aides, observers, student teachers, whatever – they just get younger and younger, wearing cuter and cuter clothes. I, on the other hand, am old don’t really give a rip about what I’m wearing. Usually that works out just fine, but when I get to the point where I realize that I couldn’t dress up even if I wanted to, it gets a little worrisome. Then I remember that I teach preschool and my hobbies are ‘sitting on a stool’, so I relax and realize that there is no need for nice clothes. 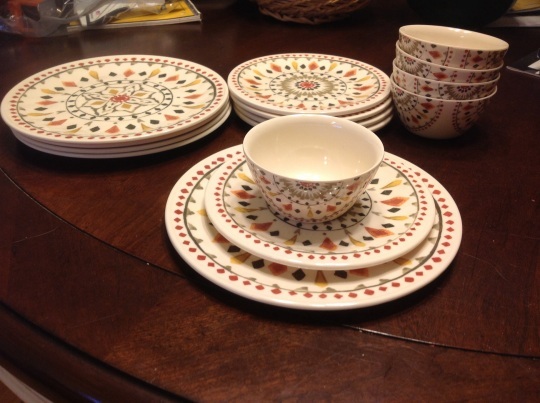 (Topic switch) I went to Target on Saturday for some new dishes for my housekeeping area. My old ones are fairly cracked and it’s time to replace them. I love the pattern. These are plastic. Plastic!! (Topic switchback. Are you getting whiplash?) I was walking by the clothing section and saw that the sweaters were deeply discounted. I picked up three: a cardigan with *gasp* decoration! 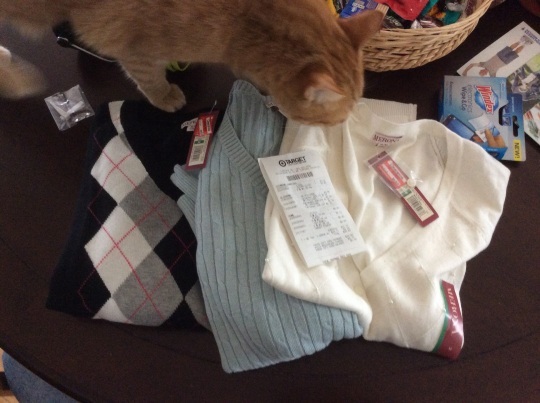 and two sweaters that are not regular cardigans. (Those are tricky. I can only wear them on cloudy days because my room heats up like an oven when it’s sunny.) The prices were right – 6 bucks for two and 8 1/2 for the other. At the checkout, the cashier asked if I participated in blah blah blah. I said I did not, so she explained blah blah blah. I said, “That sounds nice.” Since I didn’t have blah blah, she used her own blah blah account, scanned something on her phone and boom! I got 20% off on those sweaters! That blah blah sounds like a good deal. I really wish I would have been paying attention…..
Congrats on your cheap purchases! I love cheap clothes! I forgot to say: “cardigan” was a vocabulary word for my sixth graders. It was part of a list of words that originated from people or place names. In this case, the open-front sweater was named after the Earl of Cardigan, J.T. Brudenell, who lived in the first half of the 1800’s. And I love those dishes! How chic! I hope those youngins’ enjoy the coolness! I like your sweaters and Aaron can tell you about cartwheel.